St. Paul, Minn., April 21, 2015 PolyMet Mining Corp. TSX: POM; NYSE MKT: PLM today reported that it has filed its financial results for the year ended January 31, 2015. PolyMet controls 100 percent of the development-stage NorthMet copper-nickel-precious metals ore-body and the nearby Erie Plant, located near Hoyt Lakes in the established mining district of the Mesabi Iron Range in northeastern Minnesota. Completion of the public review and comment period on the supplemental draft Environmental Impact Statement (SDEIS) on March 13, 2014. U.S. Environmental Protection Agency EC-2 rating of the SDEIS, the highest rating for a mine proposal, so far as we are aware. The Minnesota Department of Natural Resources (MDNR), the U.S. Army Corps of Engineers and the U.S. Forest Service (the Co-lead Agencies) made substantial progress on responding to the 58,000 public comments received on the SDEIS. In October 2014, the Commissioner of the MDNR indicated at a public meeting that he thought preparation of the final EIS would be completed in the spring of 2015. PolyMet advanced its Definitive Cost Estimate and Project Update. PolyMet secured a $30 million loan facility from Glencore, which is expected to fund the company through fiscal 2016. PolyMet received the first tranche of $8 million prior to January 31, 2015 and the second tranche of $8 million on April 15, 2015. The remaining $14 million is scheduled to be drawn in two further tranches on or before July 1, 2015 and October 1, 2015. Glencore also agreed to a one-year extension of $25 million initial principal convertible debentures, originally issued in 2008, that were due September 30, 2014. Reviewing the year, Jon Cherry, President and CEO of PolyMet stated, Our 2015 fiscal year demonstrated significant progress as a result of a tremendous amount of hard work on the part of the PolyMet team and its technical and legal advisors as well as by the various state and federal government agencies and their advisors and consultants. We continue to enjoy strong support for the project statewide and especially on the Iron Range, where we can strengthen and diversify the economy of northeastern Minnesota and continue its mining heritage. Cherry continued, Complete and thorough analysis and review of the extensive comments on the SDEIS has been essential in order for the Co-lead Agencies to develop a robust final EIS and lay the basis for permits to be issued. This groundwork places PolyMet in a strong position as we progress through completion of permitting, arranging finance and then to the ultimate objective of building and operating the NorthMet Project. Publication of the final EIS in the Minnesota Environmental Quality Board Monitor and the Federal Register, which PolyMet anticipates will be in the summer of 2015. Submission of permit applications around the same time as publication of the final EIS. Decision on state permits within 150 days of application under state guidelines. 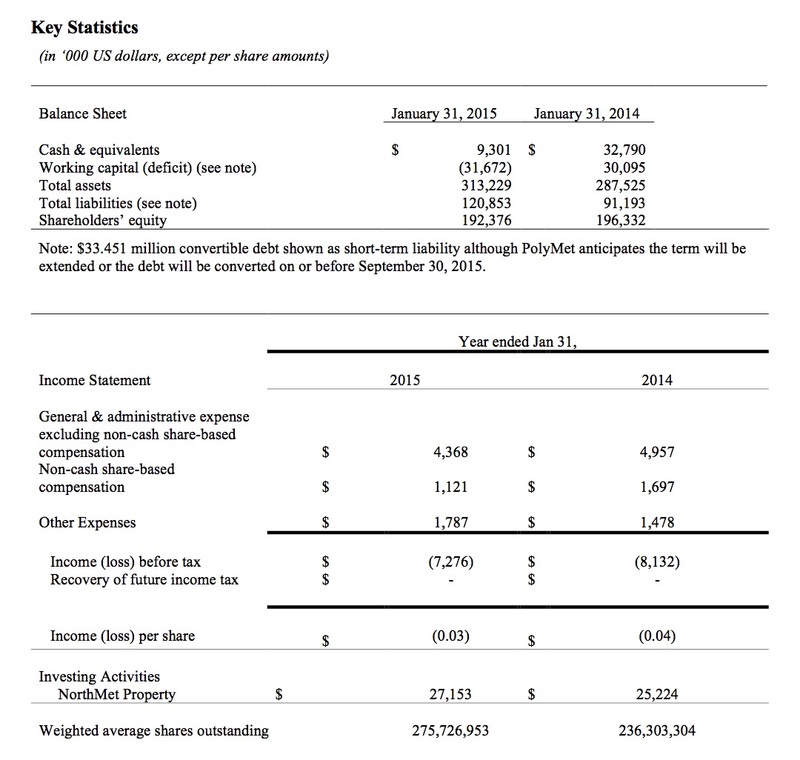 Loss for the year ended January 31, 2015 was $7.276 million compared with $8.132 million for the prior year period. General and administrative expenses excluding non-cash stock-based compensation in the year ended January 31, 2015 were $4.368 million compared with $4.957 million in the prior year period. At January 31, 2015 PolyMet had cash and cash equivalents of $9.301 million compared with $32.790 million at January 31, 2014. PolyMet invested $27.153 million into its NorthMet Project during the year ended January 31, 2015, compared with $25.224 million in the prior year period. As of January 31, 2015 PolyMet had spent $85.4 million on environmental review and permitting, of which $78.9 million has been spent since the NorthMet Project moved from exploration to development stage.